Coca–Cola Stage set to rock this summer! Calgary - The Calgary Stampede announced the 2013 Coca-Cola Stage lineup to over 1,000 of music super-fans who packed Flames Central tonight to hear who will be playing their favourite stage. Two of this year’s acts, Dean Brody and Down with Webster, put on exclusive performances to warm up the crowd for what is one of the most exciting and diverse lineups ever for the Coca-Cola Stage. Some of the big names joining these performers are Hedley, Sam Roberts Band, k-os, and YouTube sensation Walk Off The Earth. Coca-Cola has been a long-time sponsor of the Calgary Stampede and today the organizations renewed a multi-year sponsorship agreement. 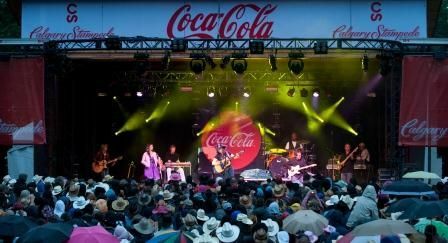 In addition of its support of the Coca-Cola stage , the official soft drink company of the Calgary Stampede also supports two entry programs: Coca-Cola Save $8 and Coca-Cola 2 for $25. Concerts on the Coca-Cola Stage and Nashville North are free with admission to Stampede Park. For more information and a full schedule, visit www.calgarystampede.com. Please refer to the backgrounder for more information about the bands playing the Coca-Cola Stage in 2013. Photos are available upon request. As we enter our second century, the Calgary Stampede celebrates the people, the animals, the land, the traditions and the values that make up the unique spirit of the west. The Calgary Stampede contributes to the quality of life in Calgary and southern Alberta through our world-renowned 10-day Stampede, year-round facilities, western events and several youth and agriculture programs. Exemplifying the theme We’re Greatest Together; we are a volunteer-supported, not-for-profit community organization that preserves and promotes western heritage and values. All revenue is reinvested into Calgary Stampede programs and facilities.